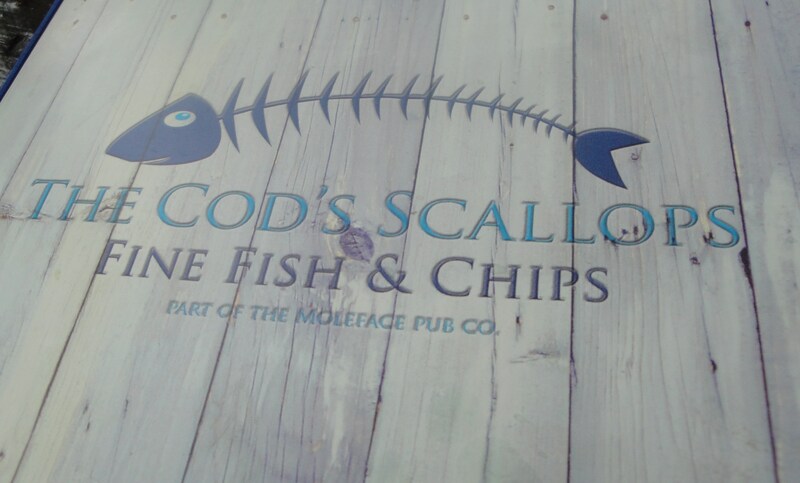 Once I discovered that the Moleface chain had a Fish and Chip shop inside it’s stable of pubs and resturants then I had to check it out. The Cod’s Scallops is located up near Wollaton Vale on Bramcote Lane. I was actually expecting to find a pub style restaurant but instead I was pleasantly surprised to find a proper fish and chip shop. Inside there is a traditional fish and chip counter and a wet fish bar where you can buy a selection of fresh fish. You can get your fish supper to take away or you can choose to sit inside on one of the two sets of bench seats. These run along the wall on either side of the door way with about six tables seating something like 20 or so people. It was talk like that which had encouraged me to make the journey across town to track them down. A sign on the counter informed us that Today’s catch had been landed by ‘Brim’. I am assuming that was the name of the boat or a salty seasoned fisherman. Either way it lent credence to the talk of “Today’s catch….”. We sat down and ordered the Haddock and Chips for £7.50 and a mug of tea it took about 10-15 minutes to come out. It was worth the short wait. This was an excellent plate of haddock and chips, I don’t want to go out on a limb and say it is the best fish and chips in Nottingham, so I am forgetting thoughts of any limb and I am just saying that in my opinion it is ‘some’ of the best fish and chips I have eaten in Nottingham. Ah now that got your attention. What was that you muttered? Georges traditional ? Nope sorry I honestly believe that this is way better, ‘and’ I really like Georges as well. There is something slightly wonderful when you get the holy trinity of fish and chips, (forget the holy trinity of Creole cooking celery, bell pepper and onion), I am talking of the fish and chip supper holy trinity which is perfect fish, great batter, and excellent chips. It is so rare to see all three present on the same plate, but here at the Cod’s Scallops they are getting close. Starting with the fish, it is very fresh, a plethora of succulent juicy flakes combined with a great meaty flavor. The fish was so white it could have been to the dental hygienist on its short journey from coast to fryer. The chips? they were freshly cut from Maris piper potatoes, offering up a firm and solid bite, together with a creamy filling. No grease and nothing to complain about. Now the batter, it is not often that you end up having a discussion about the merits of batter during lunch is it? Often the batter in Nottingham is crisp on the outside yet still soggy on the inside, almost undercooked and that is probably how we like it up here or rather have become accustomed too. The alternative is often crispy towards the level of bone dry (also not that great). In contrast the batter here is quite amazing it was verging on a tempura batter, light, airy and (now this might sound impossible) with a crispy fluffiness. The result was quite delightful. Previous Post Cafe Hockley – I just can not walk past a Daily Specials board! Yes I agree with all of this, but the best fish n chips I have EVER had is from The Rectory Fish Bar in West Bridgford. And I have had a lot of fish n chips in my time!